Max Forman-Mullin as Septimus Hodge, Amanda Ramos as Thomasina Coverly. Photo by Ben Krantz Studio. The politics in academe are virulent because the stakes are so small. That triviality applies as well to the contributions of academics in extending the boundaries of knowledge. Although profound breakthroughs do occur, most researchers and their universities are content with minor advances to demonstrate the commitment, vigor, and integrity in the process, as well as the rigorous competence of their faculty. These niches of new knowledge may be particularly minute in their consequences in the humanities, where investigations of historical documents may unearth some minor revelation about a poet or additional details about a historical event. But the point is raised in Tom Stoppard’s complex play Arcadia – What is the value of learning something inconsequential about a historical person or event compared to learning something of scientific note? Shotgun Players confronts this respected play with a charming and animated, jewel-box production. The action takes place in Sidney Park, an English country estate. Some scenes are contemporary. Others are from the early 19th century. In the final scene, both casts are on stage, oblivious to one another. In modern time, a professor, Bernard Nightingale, seeks to prove his theory that Lord Byron, a house guest at Sidney Park, fled England because he had killed an unsuccessful poet, Ezra Chater, in a dual prompted by Byron’s affair with Chater’s wife. Meanwhile, best-selling author Hannah Jarvis is researching a yet unidentified hermit who lived on the estate around the same period. Finally, a current resident of the house, graduate math student Valentine Coverly pores over mathematical documents from the same earlier period. They were produced by his precocious ancestor, teenage girl Thomasina Coverly, and Septimus Hodge, her tutor and friend of Byron. Valentine hopes to show that his ancestor expanded scientific knowledge. As expected from any Stoppard work, Arcadia is highly literate and entertaining. It is also full of passionate characters, crammed with information, and plays like a grand detective story as the moderns unravel the mysteries of the past while entwining themselves in amusing interactions. The streams concerning the literary focus unfold clearly. The one concerning science is somewhat more obtuse and may confuse the uninitiated. Among other scientific notions, we are hit with Fermat’s Last Theorem, the Second Law of Thermodynamics, entropy, chaos theory, and more – a lot for a rookie to absorb. In an interesting twist, the playwright seems to take a little jab at academics. Stoppard’s professor is obsessed with his television appearance to promote a theory which he has pursued without scientific scrutiny. Conversely, the mass market author (a proxy for Stoppard?) is systematic in her inquiries and demanding in her proofs. Although Arcadia is a highly deserving theater piece, it is not without weaknesses. Some of the scientific theories have less relevance and impact than others, and the play might benefit from streamlining the scope of the scientific investigation and better explicating what remains. Several roles contribute little to the proceedings and could be eliminated. Also, the play lacks realism is many ways, to wit, three researchers with totally different agendas converging on the same place at the same time to investigate matters from the same historical point in time. Shotgun’s production is vibrant with fine performances. Aaron Murphy as the haughty but yearning Bernard and Jessma Evans as the determined and hard-to-get Hannah crackle with sexual tension as they challenge each other intellectually. Max Forman-Mullin delights as the suavely, slippery Septimus, who is drawn to his ingénue student, Thomasina, played with amused inquisitiveness by Amanda Ramos. The joker in the deck is Justin Dupuis’s cuckolded Ezra, a humorous prancing dandy. But Artistic Director (and director of the play) Patrick Dooley’s interesting approach to staging distinguishes this production. Not satisfied with a traditional set, he offers a production in the round. The felicitous result of this decision is a 40% increase of seating capacity with associated potential revenue, along with intense intimacy between actors and audience. However, because the additional seating is on the stage, the performance arena is reduced to postage stamp size. With the obligatory props of a library table and accoutrements at the center of the small stage, it sometimes seems that characters are running a tight ring around a mulberry bush, yet the overall effect of the closeness is positive. And the circle design works symbolically as the story is full of romantic chases, retribution pursuit, and search for knowledge. Ultimately, we must return to the question of substance to ask whether this play has meaning to us. What is the difference whether Lord Byron killed a man in a dual or whether a brilliant girl realized mathematical theory beyond its known boundaries, if any findings were not passed on to others? Fortunately, Arcadia offers more with a multivariate sweep exploring the scholarly process, love, ambition, and more in an enticing manner. 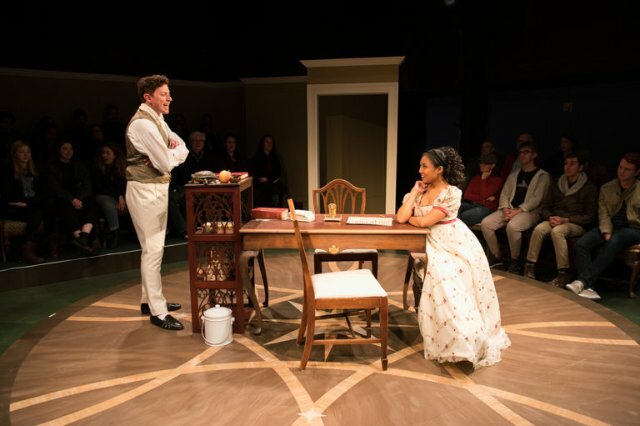 Arcadia by Tom Stoppard is produced by Shotgun Players and plays at Ashby Stage, 1901 Ashby Ave., Berkeley, CA through January 6, 2019.